IBM® TS4300 Tape Library is a high-density, highly scalable, easy-to-manage solution designed to keep data securely stored long-term, while helping reduce the costs associated with data center space and utilities. Its modular design enables you to increase cartridge and drive capacity as needed—scale vertically up to seven modules with expansion for Linear Tape-Open (LTO) Ultrium cartridges, drives and redundant power supplies. IBM TS4300 enhanced data protection helps meet security and compliance requirements. The modular design enables you to increase cartridge and drive capacity as needed. 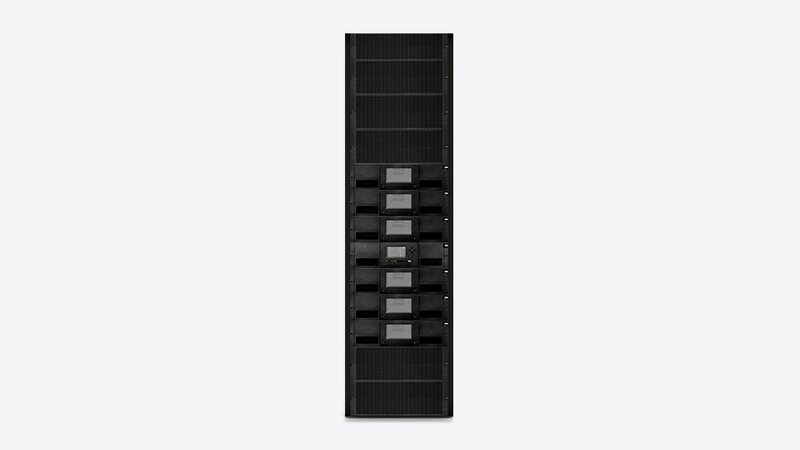 The TS4300 can scale vertically with up to seven modules, with expansion for LTO Ultrium 8, 7 and 6 cartridges. Supports WORM cartridges to enhance data protection and provides library-managed encryption with IBM Security Key Lifecycle Manager. TS4300 is based on an embedded, open-source software architecture to help speed deployment and simplify management. TS4300 is a high-density, highly scalable, easy-to-manage tape library designed to keep data securely stored long-term, while helping reduce the costs associated with data center space and utilities. Start small but grow big with this IBM TS4300 tape library configuration. Get more capacity and performance with this IBM TS4300 tape library configuration.